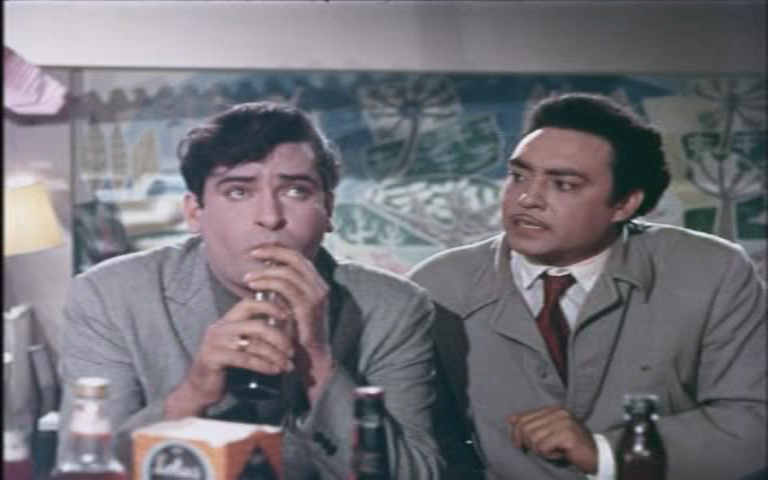 This is one of my favourite Shammi movies, although I’ve never been able to clearly decide why I prefer it over some of his other equally fabulous films. Maybe it’s because there is plenty of Shammi shimmying and trademark contortions going on? 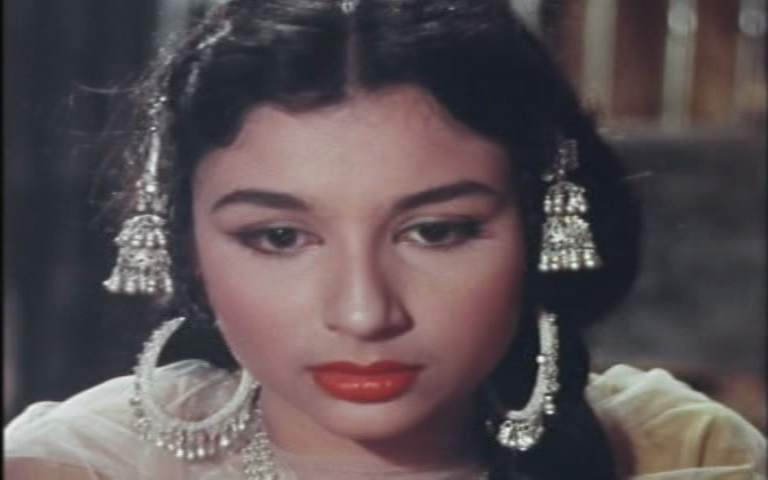 Or perhaps because Sharmila is beautifully innocent and the love story is sweet with a fantastic soundtrack? Whatever the reason, it’s always a film I watch to the very end and enjoy every second. 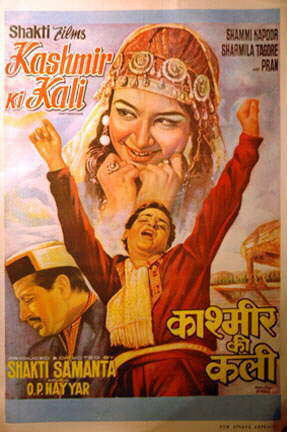 The film opens with Seth Rajiv Lal gaining control of his father’s businesses. He is a millionaire’s son and wants to give the business profits back to the people who actually do the work. His mother is appalled by this regrettable instability in her son and decides that the most appropriate way to curb his socialist tendencies will be to marry him off. Almost overnight, the house is full of prospective brides and their hopeful parents but Rajiv manages to get rid of them all by a not very convincing display of madness. 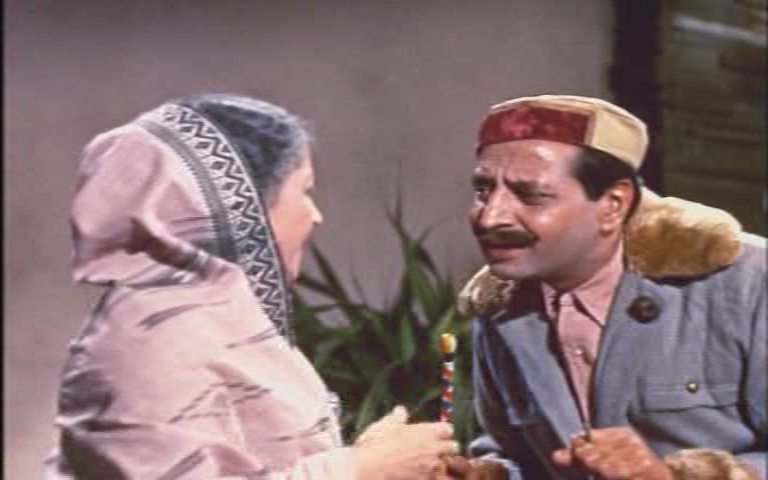 Deciding that he has to get away from his mother and thus avoid more potential brides, Rajiv leaves to visit the family holiday home in Srinagar with his friend Chandar (Anoop Kumar). Along the way he has to spend the night on the veranda of a small hotel as the rooms are full with Champa and her friends who have come to dance at a local fair. Rajiv’s first meeting with Champa isn’t too auspicious as she empties a bucket of water over him and his smoking stove, but her kindly nature is revealed when she later takes him a blanket to stop him from freezing overnight. It’s not long before Rajiv has succumbed to her charms, but he is a wealthy man and she is a flower seller who has no time for the indolent rich. At their next meeting, he pretends to be a driver so that she will look more kindly on him. There is a slight diversion here as the family caretaker Bola Ram (Dhumal) has rented out Rajiv’s house to a party of 3 girls and their guardian Rama Devi (Tun Tun). In an attempt to get rid of them all Rajiv reveals his true identity and then immediately has to pretend to be the insane friend of Chandar, who in turn pretends to be the real Seth Rajiv, to make sure that Champa doesn’t find out the truth. This allows for some mix-ups between the three girls, Chandar and Rajiv as the former try desperately to snare a rich man as a husband, Chandar enjoys the attention, and Rajiv only has eyes for Champa. Confusing? Well, not really, as most of the time Rajiv just acts insane unless he is with Champa, so it all makes sense – honestly! This is a wonderful song where Rajiv romances Champa while sailing on the lake – only Shammi could get away with these contortions in a boat! Just as Ravi and Champa are falling in love, intrigue is added as local bully Mohan threatens Champa’s blind father Dinu. Mohan is also determined to marry Champa and warns Dinu that he will reveal the truth about her parentage if he doesn’t get his way. The plot thickens as Mohan does some investigating and finds out exactly what did happen the night that Champa’s father lost his sight. There are many complications on the way to the film climax but naturally there is an old family servant who reveals the truth just before she dies and almost everything is explained by the end. The obstacle of Mohan in the way of Champa and Rajiv’s romance does make for some great disguises such as this one at a local fair. While the story is improbable at best, there is so much going on that the many plot holes don’t really matter. 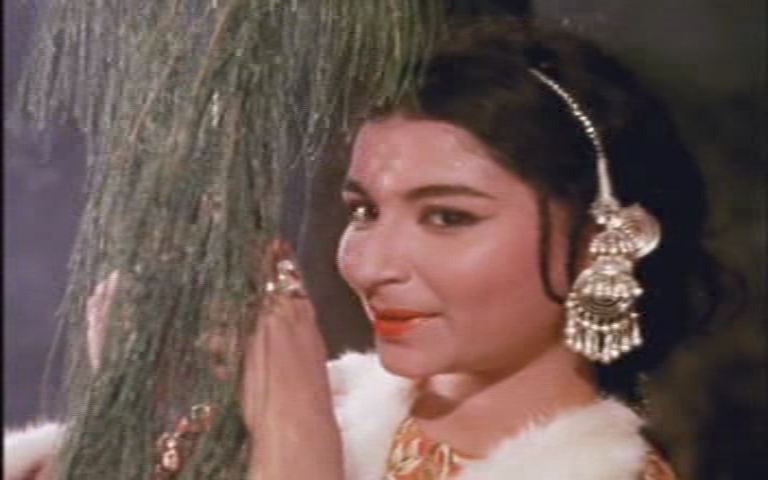 I adore Shammi in this film. He cavorts around with plenty of trademark hair twitching, and looks to be having the time of his life. 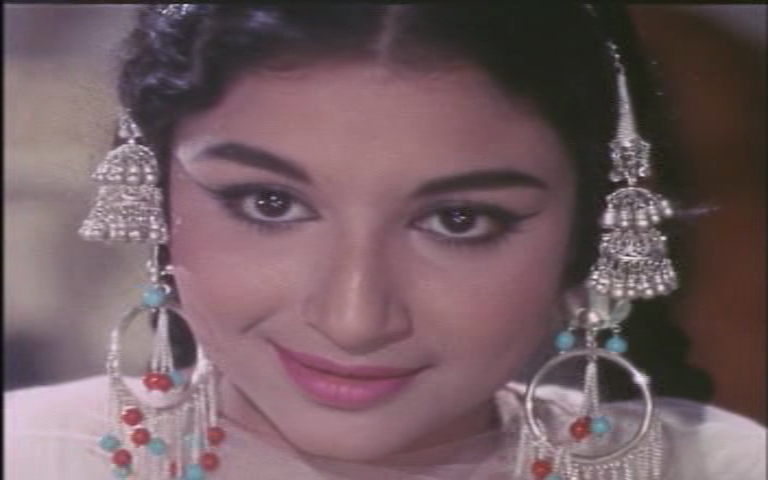 And really, who can blame him when Sharmila looks so totally fabulous. 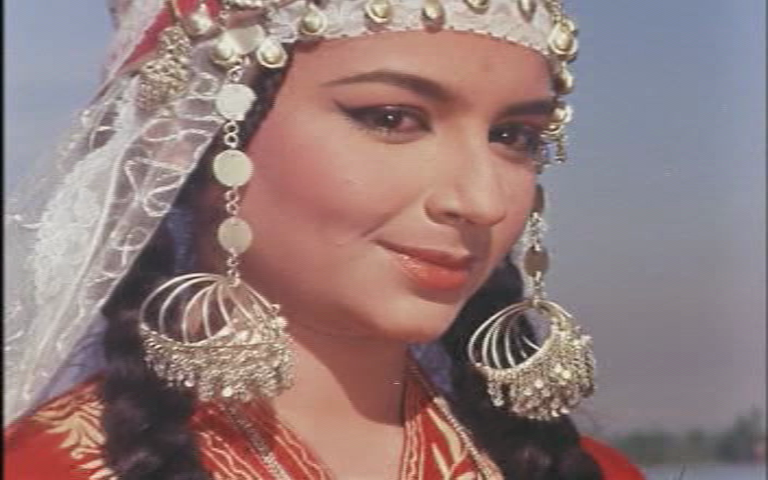 This is one of her very early films and she does look very sweet and natural as a Kashmiri flower girl, instilling her with grace and beauty which contrasts well with Shammi’s more over-the-top persona. She has a wonderful collection of massive earrings and hair adornments. I would love to know how she managed to dance without them either hitting her face or getting caught in her hair as this is a skill I’ve never mastered! Pran is suitable slimy and conniving as the villain, although I do wonder how he always knew the right place to be lurking at precisely the right time. 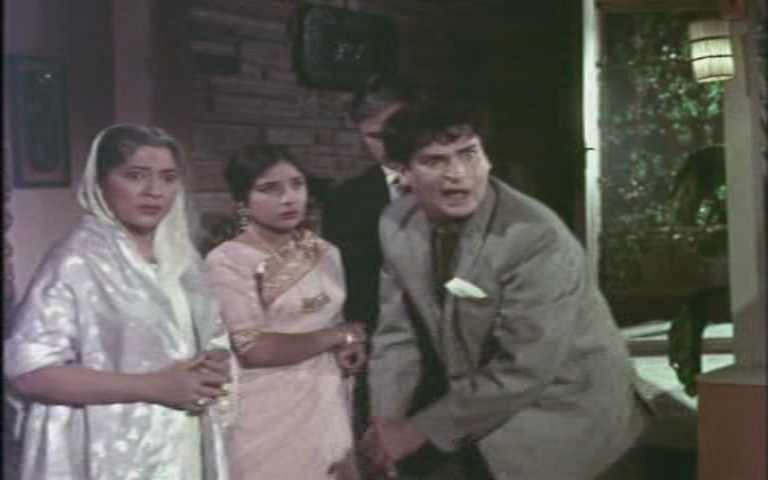 Nasir Hussain does a very good job of being blind Dinu here and in the flashback scenes is very convincing as the alcoholic father. I’m not entirely sure that Dinu’s blindness was enough of a reason for him to change his ways, but there were enough shades of grey in his later actions to make him a more plausible character. The comedy track with Chandar, Bola Ram, Rama Devi and the girls works well for me within the main story, although with so much else happening in the plot it probably was an unnecessary addition. Another highpoint of the film is the soundtrack. Mohammed Rafi and Asha Bholse are perfect as the playback singers for the two leads, and the music by O. P. Nayyar is beautiful. 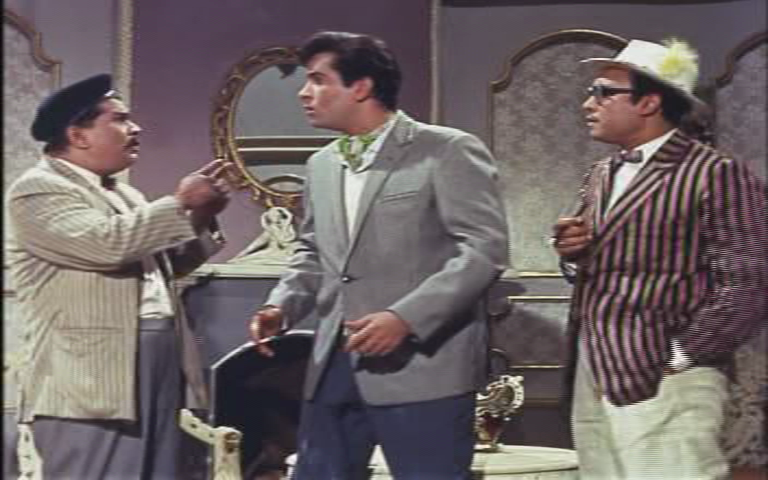 This is probably a film more for the Shammi fan as he really does throw himself into the role with great gusto and it might be a little too much for anyone not accustomed to his mannerisms. But Sharmila is excellent, the pair have good screen chemistry as a couple together and the story really does have almost everything. A 4 ½ star film for me. This entry was posted in Bollywood and tagged Anoop Kumar, Asha Bhosle, Dhumal, Kashmir Ki Kali, Mohammed Rafi, Nasir Hussain, Pran, Ramesh Pant, Ranjan Bose, Shakti Samanta, Shammi Kapoor, Sharmila Tagore, Tun Tun. Bookmark the permalink. 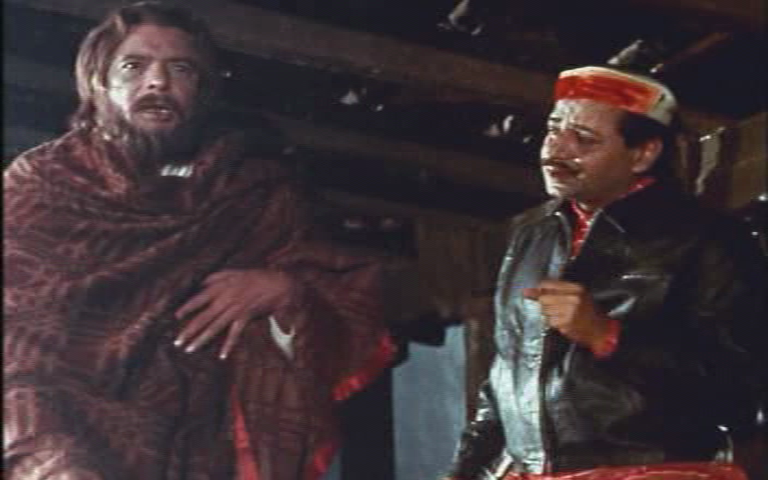 Shammi’s performance in the “boat number” is one of his most entertaining – because he’s sitting for a large part of it – his upper body moves are exaggerated to the point where he looks afflicted. A definite rewatch. 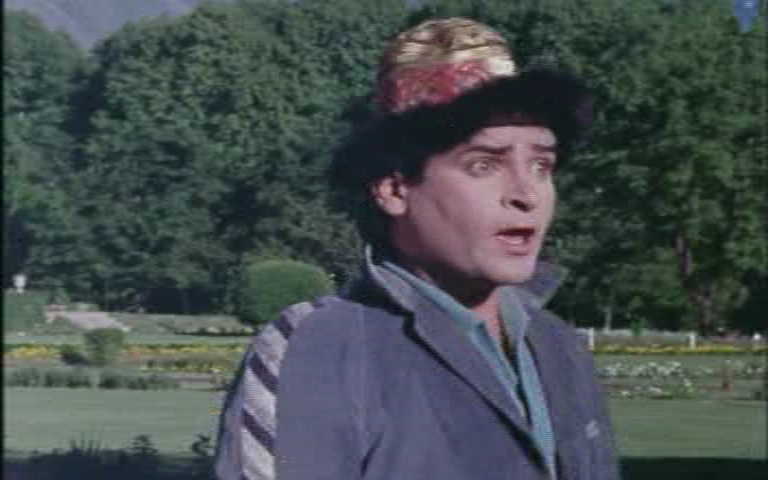 Yes shammi kapoor movies were I have posted some movies on torrents too.